We’d love your help. Let us know what’s wrong with this preview of Haatchi & Little B by Wendy Holden. When Owen met Haatchi, the lives of one adorable little boy and one great, big dog were destined to change forever. Owen-known to his family as "little buddy" or "Little B"-has a rare genetic disorder that leaves him largely confined to a wheelchair. Before being united with Haatchi, Little B was anxious and found it difficult to make friends. Haatchi-an adorable Anatolian Shepherd puppy-was abused and left for dead on railroad tracks. He was struck by an oncoming train, and although his life was saved, his leg and tail were partially severed. Haatchi was left massively disabled and totally dispirited. But kind-hearted Will and Colleen Howkins, Little B's father and step-mother, decided to introduce the big dog and the little boy to each other, and an unbelievable bond was formed that transformed both boy and dog in miraculous ways. To ask other readers questions about Haatchi & Little B, please sign up. Has anyone read this? If you love dogs, you will just LOVE this one!! Being part of the story I admit to being rather bias with my rating. Having read most of the reviews I was concerned to see several people stating they would have liked to have seen pictures. I can only assume that if you received a free copy it came without them as I can assure you there are definitely pictures in it as I took most of them!!!!!!! The Kindle edition also has the pictures at the very end so it is important to scroll through the acknowledgement in order to reach them. Our goal fro Being part of the story I admit to being rather bias with my rating. Having read most of the reviews I was concerned to see several people stating they would have liked to have seen pictures. I can only assume that if you received a free copy it came without them as I can assure you there are definitely pictures in it as I took most of them!!!!!!! The Kindle edition also has the pictures at the very end so it is important to scroll through the acknowledgement in order to reach them. Our goal from the beginning has and always will be to introduce Schwartz Jampel Syndrome to the world stage and we are pleased that this book is doing this for us and all the others who live with this condition. Thank you to every one of you who have and ever will read it, we are truly grateful for your precious time. A defenseless five month old Anatolian Shepherd had been clubbed over his head into unconsciousness and was tied to railroad tracks to end it's life. But, by a miracle of God, this amber eyed puppy was found and taken to RSPCA's Harmsworth Memorial Animal Hospital. Hid tail and left rear paw were mangled and the vet removed both the tail and the whole leg. Even with the immense cruelty this young pup had endured by a human, he was happy to greet any an I won this book from a contest on Goodreads. A defenseless five month old Anatolian Shepherd had been clubbed over his head into unconsciousness and was tied to railroad tracks to end it's life. But, by a miracle of God, this amber eyed puppy was found and taken to RSPCA's Harmsworth Memorial Animal Hospital. Hid tail and left rear paw were mangled and the vet removed both the tail and the whole leg. Even with the immense cruelty this young pup had endured by a human, he was happy to greet any and all of the staff while in recovery with a wee lick and gentle nudge. It just amazed and surprised everyone on staff what a gentle and sweet disposition he had. But this large breed will need many visits to the vets and more operations during the course of his life, which few people could afford or handle. They hoped for the sake of this kind gentle creature that such a person will come into his life and give him the love and tenderness that he so deserves. Owen Howkins, born in 2005 has been diagnosed with Schwartz-Jampel Syndrome which is an extremely rate condition identified in 1962. Only 30 people are known worldwide to have this disease. It causes the muscles to contract and puts constant pressure on the skelton causing constant pain. There is no cure. Owen's parents were finding the pressure of Owen's illness as well both their military careers finally taking a toll on their marriage and the finally divorced and Owen's Dad, Will had sole custody. Will later met Colleen Drummond and they moved in together and Will. Colleen and Owen made a happy family. Finally, mainly due to Colleen, 'Haatchi' the broken Anatolian Shepherd was adopted and instantly Owen and Haatchi became inseperable. It's as if they could see in each other that their pain an suffering will help bring each other a new understanding of themselves. The tears began with the prologue and throughout each chapter I had tears of joy along with tears of heartache. How a sweet and loving puppy became the victim of horrific cruelty at the hands of a human but immediately gave nothing but unconditional love to anyone showing him the smallest act of kindness. Then Haatchi meet a broken little boy who also endures pain on a daily basis and immediately they are drawn to each other, in ways that enrich both their lives. Author, Wendy Holden did an excellent job!!!! Wonderful story whether you are an animal lover or not!!! Before I get jumped on by Little B. and Haatchi lovers, let me say... I love LOVE love Little B. and Haatchi, too. What I didn't love was this book and the author. Read my updates for some of the more pronounced problems I had with this book. If you love Owen and Haatchi you are better off going to their Facebook page and their other social media outlets and learning about them there. The summary promises a "boy and his dog" story, but it is really a book about the parents' sacrifices and an unab Before I get jumped on by Little B. and Haatchi lovers, let me say... I love LOVE love Little B. and Haatchi, too. What I didn't love was this book and the author. Read my updates for some of the more pronounced problems I had with this book. If you love Owen and Haatchi you are better off going to their Facebook page and their other social media outlets and learning about them there. The summary promises a "boy and his dog" story, but it is really a book about the parents' sacrifices and an unabashed neverending commercial for a raw meat dog food company that has given Haatchi free food for life. The title should be Our Difficult Lives with Little B. and Haatchi: A Story About Free Dog Food for Life. The parents' lives are sometimes described down to the minutiae, but Owen's (Little B. 's) thoughts, feelings, and experiences are generalized and sometimes even glossed over. The importance given to an idea that the person who left Haatchi on the railroad tracks "may have been" Eastern European had nothing to do with the story. Even if it had been a fact, what does that have to do with the story? People of all nationalities do horrific things to animals. Then at the end of the book the author had to make one more prejudice swipe about a man with darker skin and dark hair. Why? Then there was the use of the term "red indians" instead of Native Americans and the description of using a "humorous" stereotyped action to distract Owen during a medical proceedure. Why not just say the parent made funny faces, instead? Did Owen's parents read this book? Were they okay with these things? I hope not. Would Little B. be happy a book about him has such inclusions? Where were the editors? It was mentioned several times in the book that the many public exhibitions and events they took Haatchi to were to dispell people's unfounded fears and impressions about Anatolian Shepherds, but comparisons kept being made using the word "unlike", as in Haatchi's calm, friendly, tolerant nature was not like a typical dog of that breed. So how is that helping the public's view if it is saying most of the breed's members are not typically good natured? Let's take a moment for a group head-scratch. This next sentiment left me seething... Owen's physical problems occur because of a genetic disease. He was the first grandchild on both sides of his family and near the end of the book it is stated that when a pregnancy is announced in the family it is darkened by the thought of this disease, but when the baby is born perfect it is cause for an extra jubilant celebration. Why not celebrate a new family member to love with the same jubilation, no matter how perfect or imperfect, and just as an aside have a humble sigh of relief. I get the idea, but it was presented in the wrong context. I hope Little B. never reads this book. When I first started reading this book I thought the author was simply a bad storyteller, but as I read I realized the feeling was exactly like reading an extremely long magazine or news site article, complete with paid promotions. I have stumbled across this feeling before with books constructed of blog posts put in chronological event order, but this story is lesser than that; at least bloggers are usually skilled at storytelling in a more literary sort of way. This book was too journalistic in feel and very media shaded. The author would include the same accolades given to Little B. and Haatchi, almost word for word, and then name drop over and over and over, again and again; wasting space that could have been used for telling Little B. and Haatchi's personal story. The book read like a patchwork of celebrity type People Magazine, parenting periodical, wedding mag, psychology self-help, and dog fancy publication articles with some dry newspaper articles thrown in for good measure. After I finished the book and looked at the author's bio on the side of the Goodreads page I was not surprised to see she is a journalist. A significant chunk of this book is given to an engagement, wedding, and honeymoon; with too many details about the parents' marital hopes and dreams and minutiae about the wedding event down to a description of why each guest was specifically invited, and a word for word quotation of their mile-long personal wedding vows, like it was written for the socialites' section of a newspaper, or a celebrity wedding article in People magazine. What about Little B. 's hopes and dreams? A story about "a boy and his dog" this is not. I have no words to say how beautiful this story was. The friendship between Owen, who suffers from a rare disease and a huge anatolian shepherd Haatchi was truly heartwarming and inspiring to read, and showed how much good there's still in the world. I definitely recommend it! Haatchi & Little B: The Inspiring True Story of One Boy and His Dog is such an incredible story of love, devotion, courage, sacrifice, healing, and forgiveness. It's an inspiring true story of heroic people that refuse to be defeated by the inhumane cruelty of man, about those willing to go the extra mile and a half to save a soulful Anatolian Shepherd found dying on a railway track and facing certain death. Haatchi & Little B: The Inspiring True Story of One Boy and His Dog is a magical Haatchi & Little B: The Inspiring True Story of One Boy and His Dog is such an incredible story of love, devotion, courage, sacrifice, healing, and forgiveness. It's an inspiring true story of heroic people that refuse to be defeated by the inhumane cruelty of man, about those willing to go the extra mile and a half to save a soulful Anatolian Shepherd found dying on a railway track and facing certain death. 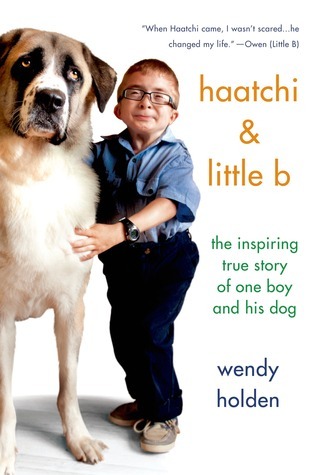 Haatchi & Little B: The Inspiring True Story of One Boy and His Dog is a magical story of how fate brought a three pawed gentle giant to a loving, little boy and a forever home. Dog and boy would always require special attention due to their own special needs, but HOW did the Fates know that placing Haatchi with Little B would be the perfect saving grace for both?! My guess? Karma; the BEST kind of Karma that brought about the best of everyone that came in contact with the Howkin's and their beloved dog, Haatchi. East London. January 9, 2012 was a night of horror for the Anatolian Shepherd puppy. That someone had intentionally placed the animal in harm's way is certain. After being struck by the train, tail and back leg horribly mangled, the dog managed to crawl to partial-safety, where he was found bleeding to death. Cruel intentions were thwarted on this bitter night. A dog was about to change the lives of many. Less than 50 miles away, Little B (Little Buddy) was facing struggles of his own, diagnosed with a rare condition known as Schwartz-Jampel syndrome. This is a story about a boy and his dog and how each found strength, courage, and independence from the other. "It was as if Little B had been a bud waiting for the light and love of Haatchi to wake his flower." I was really excited to win this book on Goodreads Giveaways. I did like this book, but I had higher expectations for it. I did enjoy reading the story, and I appreciate the difficulties of writing about animals, but I think the narrative style fell flat for me. One reviewer on Goodreads faulted the book for having too much detail. I fault it for not having enough (I guess you can't please everyone). For me, the book lacked imagery and I felt Holden was simply "telling"the story instead of "showing" the story. It made it hard to connect to the characters. I understood the constant POV shift in chapter one when she focuses on Haatchi and what happened to him. He is, after all, a dog and cannot tell his own story (although there is the chapter at the end). For me, chapter two was were I noticed a lack of imagery, especially as she introduces Own,and his parents. There is a shifting POV as she focuses on perspectives from Kim and Owen, and sometimes lacks smooth transitions. I felt the paragraphs were short and under-developed which led to my lack of connection with the characters. I also think the book needs pictures. I can't believe I am making that statement as an English teacher, but I think that would help. The lack of pictures could be because this is an advanced reader copy, but I am saddened this is not in my copy since this will be added to my classroom library. Most non-fiction novels about people and animals use pictures to help the audience establish connections and care about the experiences of the characters. With that being said, I think my high school students will enjoy this book. I can see this book being popular in my classroom, and I cannot wait to put it in the hands of my students. I was a goodreads firstreads winner of this wonderful heartwarming book. If you love dogs and kids this is a perfect match. Get ready to have a hanky on hand. Haatchi, an Anatolian Shepherd was abandoned on a train rail track. he was beaten by a cruel "sub human" and left to die. he was hit by the train and it destroyed his back leg and tail. he was only five months old. He was rescued. had surgery that removed his back leg and tail. He was named Haatchi in honor of another dog who made history I was a goodreads firstreads winner of this wonderful heartwarming book. If you love dogs and kids this is a perfect match. Get ready to have a hanky on hand. Haatchi, an Anatolian Shepherd was abandoned on a train rail track. he was beaten by a cruel "sub human" and left to die. he was hit by the train and it destroyed his back leg and tail. he was only five months old. He was rescued. had surgery that removed his back leg and tail. He was named Haatchi in honor of another dog who made history for waiting for his owner by the train in Japan til his death. Some people here do claim of too many details or lack of details, flat style of writing etc. I would agree on the fact that the language (although my English is not my native, but still I can differentiate ;) )could be more interesting and the sentences not so simple, BUT. I would really state that this book -and maybe it's just a period in my life and mind it fitted very well to right now - is one of the best STORIES I have ever read. How little do we have stories about those dogs, rescued from sh Some people here do claim of too many details or lack of details, flat style of writing etc. How little do we have stories about those dogs, rescued from shelters and being in a minute from being put asleep. How little do we care and want to SEE the beauty of the disabled people (well, especially in my country). This book is not much about plot and great turns of it, but so much about "JUST" a family, "JUST" ordinary people Coleen and Will, "JUST" a BOY Owen and "JUST A DOG" - Haatchi! It shows perfectly how cruel and disgusting people can be, and how giving and able for big deals the people can be. I really enjoyed this book about sweet Owen, who has a rare genetic disease, and his dog Haatchi. These two overcame many odds to be together, and it was great to read about how they found each other. Owen and Haatchi had many struggles, but they worked through them and are a great team. The only small problem that I had with this book was that it could be a bit choppy at times, and at others it seemed to ramble on a bit. Even so, I appreciated that there were so many important pieces to this st I really enjoyed this book about sweet Owen, who has a rare genetic disease, and his dog Haatchi. These two overcame many odds to be together, and it was great to read about how they found each other. Owen and Haatchi had many struggles, but they worked through them and are a great team. Overall, I found Owen and Haatchi's story very touching, and I loved how everything worked out so they could be together. They have an amazing family and lots of support, and I hope to hear more about their adventures in the future. I received an advanced copy of this book from First Reads in exchange for an honest review. This book was very powerful for me. I have an intense love for my dogs and think of them as my furbabies. In addition, I have a stepdaughter who is special needs so I understand things from Colleen's point of view. That being said, the author does a wonderful job laying the story out for Haatchi & Little B's meeting with fate and their inspiring friendship. This book will make you feel a variety of emot I received an advanced copy of this book from First Reads in exchange for an honest review. That being said, the author does a wonderful job laying the story out for Haatchi & Little B's meeting with fate and their inspiring friendship. This book will make you feel a variety of emotions including "happy tears." In fact, I couldn't read this at work during my lunch breaks anymore because it kept making me cry. Dou 5* pelos hérois e super especiais Haatchi e Owen, mas pelo livro dou 3* porque é mais documentário do que romance. Very touching story, I hope to be continued. One of the most inspiring and heartwarming novels of 2014 is "Haatchi and Little B" which I won from Goodreads Giveaways. It begins in 2010 in London, England when a severely injured five month old Anatolian Shepherd tied to tracks on a railway line is rescued. In critical condition after the amputation of a hind leg and part of his tail, this young survivor named Haatchi, the namesake of a loyal and steadfast Japanese dog, faces being put to sleep if foster care cannot be found. With the help One of the most inspiring and heartwarming novels of 2014 is "Haatchi and Little B" which I won from Goodreads Giveaways. It begins in 2010 in London, England when a severely injured five month old Anatolian Shepherd tied to tracks on a railway line is rescued. In critical condition after the amputation of a hind leg and part of his tail, this young survivor named Haatchi, the namesake of a loyal and steadfast Japanese dog, faces being put to sleep if foster care cannot be found. With the help of charitable organizations of dog loving volunteers Haatchi eventually finds a home with the Drummond-Howkins and Owen ( nicknamed "Little B" for buddy). Owen Howkins diagnosed with Schwartz-Jampel Syndrome, a rare muscular condition who's confined primarily to a wheelchair and Haatchi fall in love and forge a bond that not only rekindles new life in both of them, but helps them weather the storms they have to face in the years ahead. This is a story of courage, friendship, love and victory. Narrated by Wendy Holden, this emotionally - charged story filled with humorous moments not only recounts the experiences of an amazing little boy and a very special dog, but it includes factual information about the wonderful organizations who are dealing with the consequences of cruelty and abuse of dogs in England. This is a remarkable story that draws awareness to a rare and incurable syndrome as well as to animal welfare. Although not directly mentioned I felt the grace of God working in these lives as Haatchi survives horrific injuries and bonds with a little boy who needs the courage to face the rocky road of his life. Because this is narration rather than a well-developed plot where you connect with the characters and their plight, images of the adorable pair and their achievements would have added a pictorial dimension to the story. Little B is an exceptional child. He's smart, funny, thoughtful, sweet and most of all brave as he faces the severe challenges associated with his condition. Likewise Haatchi is his sweet-natured, watchful, and protective companion who has to cope with radical surgery and recovery more than once. When life seems dark and bleak these two never lose hope, finding that love and laughter carries them through. Kim and Will Howkins are the amazing and courageous parents of young Owen who struggle not only with maintaining their military careers, the overwhelming problems of raising a crippled child, but the stress it puts on their marriage. After their divorce, although Will a natural father and caregiver wins custody of Owen, Kim continues to be a loving influence in his life. I won this inspiring book through First Reads. I like many I'm sure never heard of Schwartz-Jampel syndrome. This book will help get the word out about this rare syndrome. I felt so much for this family while reading about their struggles and was cheering them on through their triumphs. The bond of Owen and Haatchi was so heartwarming. I have worked in nursing homes that had let animals visit the residents there. I have seen the reactions the residents have when they have contact with them. The I won this inspiring book through First Reads. I like many I'm sure never heard of Schwartz-Jampel syndrome. This book will help get the word out about this rare syndrome. I felt so much for this family while reading about their struggles and was cheering them on through their triumphs. The bond of Owen and Haatchi was so heartwarming. I have worked in nursing homes that had let animals visit the residents there. I have seen the reactions the residents have when they have contact with them. There is just something so special that happens between them. The bond between Owen and Haatchi is amazing. The author Wendy Holden does a spectacular job of telling this family's story. Of coarse I'm wishing the best for Owen, Haatchi, and their family. I will certainly be keeping a eye on their Facebook page to see how their doing. Winning a advanced reading copy was so great. I see that in the "Picture acknowledgements"at the end talks of certain pictures that were supplied. I'm going to assume that the advanced reading copy just doesn't put them in. That is one thing I thought while reading, that I wish it had pictures in the book. Also the book I won was the paperback for some reason it's coming up as hardcover on this and it doesn't give the paperback option to change it to. Haatchi and Little B tells the inspiring and moving true story of Owen Howkins (also known as Little B, short for 'Buddy') and Haatchi, an Anatolian shepherd dog who was abandoned on a railway line as a puppy and left for dead. Thankfully, Haatchi was rescued, despite sustaining severe injuries. And so Haatchi, in turn, was able to rescue Owen, at the time an anxious and withdrawn boy born with a rare genetic disorder, who found it hard to make friends. But Owen fell in love with his new three-legged canine housemate at first sight and life would never be the same. The touching story of this dynamic duo is a life-affirming tale of happiness and friendship. You'll definitely need the tissues when reading this true story. The relationship between Haatchi and Owen is absolutely incredible. It's like Haatchi is really human and knows exactly what Owen is saying to him. They climb into his crate together and have chats with each other and I'm positive Haatchi knows every word Owen says. This was both an incredible story and an incredible journey these two foraged together. Just a beautiful story all round. I received this book free through Goodreads first reads for an honest review. Wow, what an inspirational book. What both Haatchi and Little B have been through so far in their lives and are still happy. Haatchi got hit by a train and ends up losing one of his back leg and most of his tail and Little B has an extremely rare genetic disorder which causes his muscles to permanently tense. This book is about their very special bond. Little B was very shy and kept to himself until Haatchi came into hi I received this book free through Goodreads first reads for an honest review. My advance copy of this book was obtained through First Reads. One might think the story of a three legged dog and a physically handicapped boy might be treacly. Or even depressing. I did not find it so. It was an enjoyable story and a pleasant read. Ultimately I found it uplifting. Despite the cruelty of whoever first hurt Haatchi as a pup, the book showcases the goodness of the people and organizations who rally around Owen (Little Buddy or Little B) and his huge Anatolian Shepherd. The resilie My advance copy of this book was obtained through First Reads. One might think the story of a three legged dog and a physically handicapped boy might be treacly. Or even depressing. I did not find it so. It was an enjoyable story and a pleasant read. Ultimately I found it uplifting. Despite the cruelty of whoever first hurt Haatchi as a pup, the book showcases the goodness of the people and organizations who rally around Owen (Little Buddy or Little B) and his huge Anatolian Shepherd. The resilience of this boy and his dog is amazing. "Those who said money can't buy happiness, forgot about puppies." I loved this book. It was a tenderhearted story for being non-fiction. Sometimes when the stars align and all the pieces fall into place, it is beautiful. That is how this sweet little story felt. This friendship between dog and boy was heartwarming and not only brought out the best in themselves but it also brought out the best in those around them and even beyond. Sometimes we have to roll up our sleeves and get to work because w "Those who said money can't buy happiness, forgot about puppies." A heartwarming story of a brave little boy and his family who save a fantastic dog after he had suffered the most appalling cruelty. Owen Howkins was struggling with his disabilities when Haatchi was introduced to the family. The little boy instantly became attached to the big dog, despite both of them undergoing operations and treatments. They support each other and despite the hardships they have both faced, neither of them complain. This is a lovely story, simply told. Nice illustrations. Rea A heartwarming story of a brave little boy and his family who save a fantastic dog after he had suffered the most appalling cruelty. I received this book from Goodreads First Reads. What a heart-tugging novel. The idea that so many have been helped from one pup and one special kid is an amazing story to hear in great detail and I liked that the author spared no extra word unsaid. The bravery and strength of the whole family is encouraging and shining a light on this rare disease and animal cruelty with one fell swoop but with such admired zest from all really keep the tone uplifting and positive. I received "Haatchi & Little b" as a Goodreads First-reads giveaway winner. I am a dog lover & adore children, but neither was necessary to my enjoyment of this book. I was sucked in from the very first page. In 200 quickly-read pages, I experienced so many emotions, which constitutes a good read for me. It's a story about human kind - the worst, but more importantly, the very best. I highly recommend this book to everyone. I cannot imagine anyone reading the story wthout being "moved." i won this book from the goodreads giveaway and i really enjoyed this book! i am a HUGE animal lover and my heart belongs to dogs so this was a HUGE roller coaster ride for me. i couldn't put it down because i just wanted to know what happened next. this was also a little different for me because it was all based off of 110% fact, stuff that really happened. usually, the books that i read aren't completely real, so finishing this book with a smile, definitely made me feel good. This is a heartwarming story about a family, a boy and an adopted dog. I am not a pet person but this is quite an eye-opener on the plight of dogs and I assume, other pets also. It pictures a wonderful relationship where boy and pet seem to give strength and healing to each other. It raises awareness of Little B's condition as well as about animal cruelty. There's much to learn in this love-filled story. I received this book from Goodreads. This is an extremely heartwarming read! I instantly fell in love with Haatchi and Owen. Their story and their accomplishments are just amazing. Being a dog-lover I am keenly aware of the bonds formed between animal and human and reading about Haatchi and Little B gave me warm fuzzy feelings! I really wanted to like this book more because of the nature of it. And yet, it had way too many details of the relationship of Little B's (owen) dad and soon-to-be stepmom. I wanted more details of the day to day interactions with Haatchi with the family. I have read lots of memoirs about people and their animals and this is one is,sadly, at the bottom. I was a goodreads first reads winner of this delightful heartwarming book. I had never heard of Schwartz-Jampel syndrome before reading this. It always amazes me the relationships between a dog and their owners and the powers to heal. I recommend this book to anyone who wants to read a story to make you smile. I received a advance copy thanks to Goodreads. When I started reading this book I can't put it down till I was finish with it. I had so much emotion in me while I was reading it. After I finih it I had to cuddle with my dog. The true story of an English boy born with Schwartz-Jampel Snydrome and a rescued 3-legged Anatolian Shepherd and how the two of them and their family face the challenges with joy, hope and love. Good story. Now i have to go and hug my dogs and son. Wendy Holden, also known as Taylor Holden, is an experienced author and novelist with more than thirty books already published, including two novels. She has had numerous works transferred to radio and television. A journalist for eighteen years, ten on the Daily Telegraph of London, her first novel THE SENSE OF PAPER was published by Random House, New York, in 2006 to widespread critical acclaim. Wendy Holden, also known as Taylor Holden, is an experienced author and novelist with more than thirty books already published, including two novels. She has had numerous works transferred to radio and television. A journalist for eighteen years, ten on the Daily Telegraph of London, her first novel THE SENSE OF PAPER was published by Random House, New York, in 2006 to widespread critical acclaim. Her non-fiction titles have chiefly chronicled the lives of remarkable subjects. The latest is BORN SURVIVORS, the incredible story of three mothers who defied death at the hands of the Nazis to give life. She has also written the memoir of the only woman in the French Foreign Legion in TOMORROW TO BE BRAVE, and about the mother of a woman killed after marrying a Sudanese warlord in TILL THE SUN GROWS COLD. She wrote A LOTUS GROWS IN THE MUD - the memoir of actress Goldie Hawn - and LADY BLUE EYES, the autobiography of Frank Sinatra’s widow Barbara, all of which were New York Times and Sunday Times bestsellers.